These last two Saturdays I’ve wandered around the corner to the local farmers’ markets (I act cool about it, but really I’m ridiculously excited that I live so close and can do my shopping there each week… But more on that in a later post) and come back with a few little things to put in the bare garden. Last week I got baby spinach and chives, this week curly parsley. I brought my worm farm with me from my last house, and the worms — collectively referred to as The Barries — are settling in nicely. I’m a wee bit fascinated with the worm farm. You put food scraps in, basically do nothing, and out comes this amazing fertiliser. From that fertiliser you grow more food, from which there are scraps, which you put in the worm farm… Etc etc. It creates a neat little ecosystem in your own house/garden. I’m a bit obsessed with The Barries, if I’m honest. I’ve been known to pick apple cores up off the street and bring my food scraps home from a weekend away to give to them. When I used to work in an office, the other women on my team used to give me their food scraps to take home. I love The Barries. Maybe a little too much. Anyway, they’re helping me out in the new house, with my new responsibilities as resident gardener. In my last house I helped with the garden occasionally, but I was by no means the decision maker. Now I’m kinda in charge. And I’m sure I’m going to make mistakes, kill things and hopefully imprint into my brain some of the plant names that come so easily to my Mum and my old housemate Erin. Gardening regularly is a new adventure for me (any tips are welcome). In the last few days the rocket seeds I planted last weekend sprouted, and this morning some tiny, tiny shoots from the carrot seeds are tentatively peering out of the soil. I’ve spent a whole lot of time this morning crouched down next to them marveling at their tiny green-ness. I might just be eating them in a month or so. 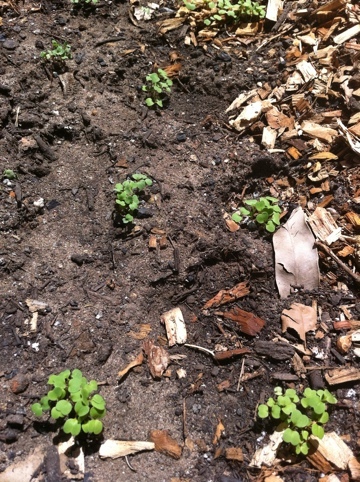 Here are the little rocket sprouts. Hello little friends… Keep growing strong, won’t you? This entry was posted in gardens, in progress, moving house and tagged gardening, moving house, new beginnings, new house by avocadoandlemon. Bookmark the permalink.